The article discusses the system CaSO4-H2O, in reference to gypsum. Gypsum is one of the most important salts in the deterioration of building materials and, particularly, wall-paintings. Objects exposed to exterior conditions where air pollution is present are the most prone to damage from gypsum. The appearance and mechanism of the damage, as well as the examination methods are described. Images, microphotographs and examples from practical experiences illustrate the subject. Gypsum is one of the most common salts causing deterioration of inorganic porous building materials. It is present on most exterior exposed surfaces and even in interior environments, under different shapes and inducing various deterioration patterns. == Gypsum, one of the most prevalent minerals, forms by precipitation from aqueous solution at temperatures under approximately 40°C. When the solution reaches higher temperatures (> 60°C) anhydrite precipitates out. 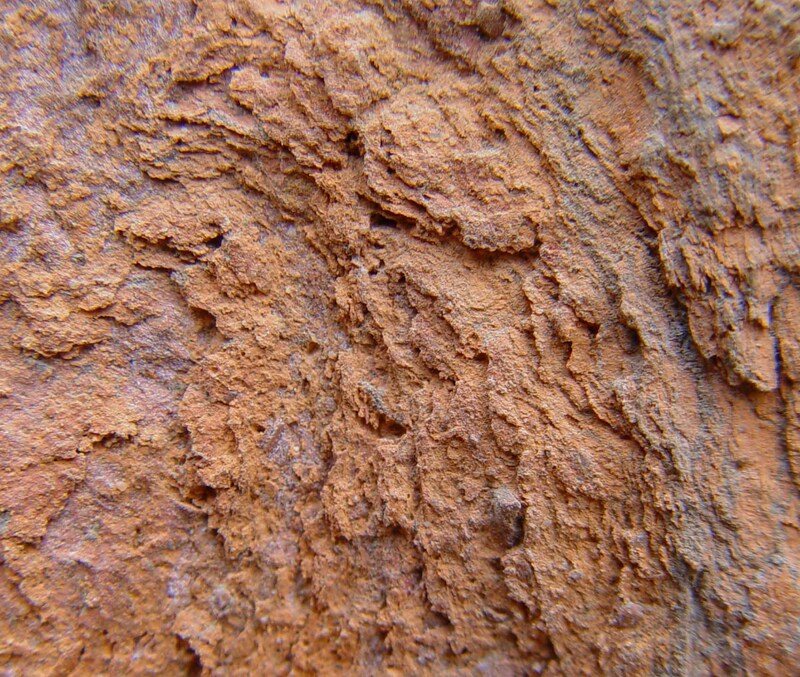 Calcium sulfate and calcium sulfate dihydrate are often present in rocks. Hemihydrate does not occur naturally. Gypsum occurs naturally in salt deposits and deserts, where "desert rose" crystals form in combination with quartz inclusions. In natural salt deposits, gypsum and anhydrite sometimes form a caprock, i.e., a massive layer of material covering the deposit. Synthetic gypsum is produced in coal-fired power plants, as a by-product of flue-gas desulfurization. It is to be remembered that gypsum can be a major component of some mortars, plasters and even some building stones (e.g., selenite, used for the base of the Garrisenda Tower in Bologna, Italy) thus being an integral part of the monuments fabric. Gypsum belongs to the group of salts with a low solubility in aqueous solution and therefore is less mobile than the more soluble ones. However, when other ions are present, its solubility can be significantly increased. For example, when halite, NaCl, is present, the solubility of gypsum can be increased by a factor four depending on the concentration ratio of the two salts. Anhydrite (CaSO4)- the above mentioned anhydrous form. Bassanite (hemihydrate) (CaSO4•0.5H2O)- a metastable form. Gypsum (CaSO4•2H2O)- calcium sulfate dihydrate. 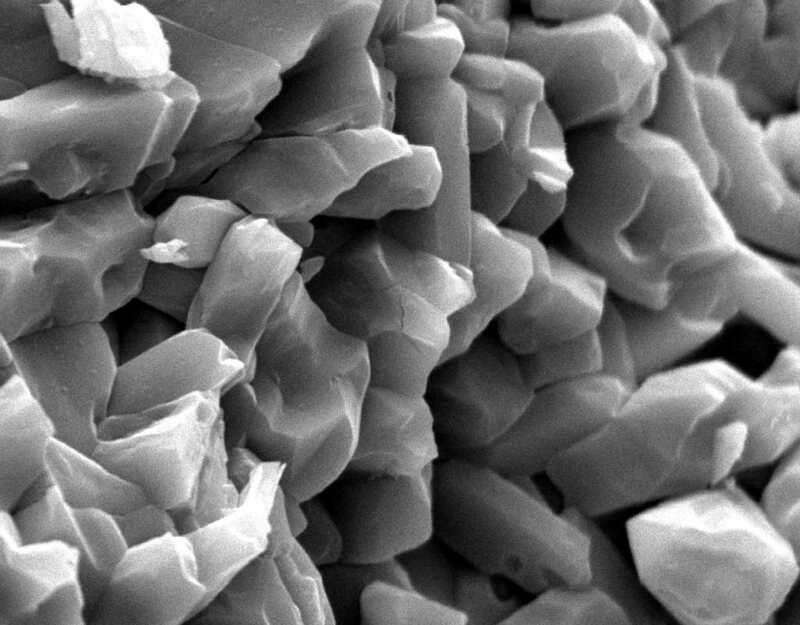 Anhydrite exists in different varieties with different chemical properties, such as different solubilities in water, depending on the conditions of its formation. The same applies to bassanite, the hemihydrate. 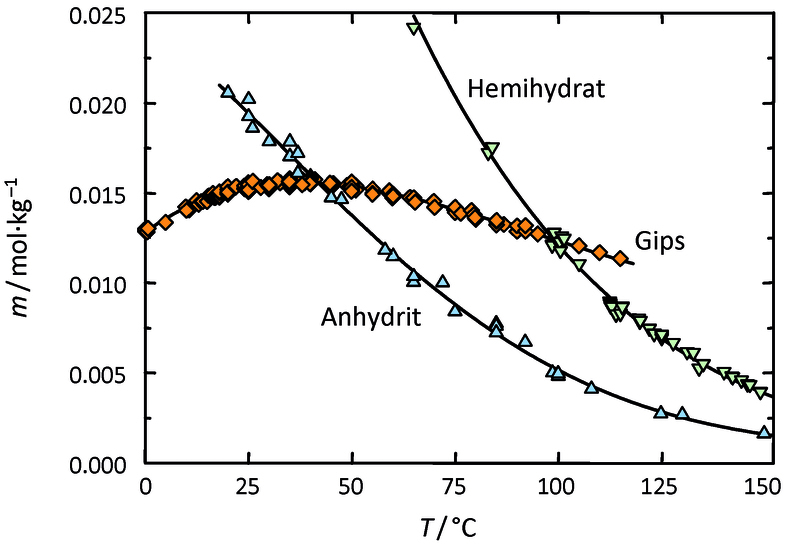 The transition temperature in aqueous solution for the gypsum-bassanite (dihydrate to hemihydrate) is in the 40°C-66°C range. Under normal climatic conditions, on monuments, the precipitation of calcium sulfate from aqueous solution will therefore be predominantly gypsum. Anhydrite forms when the temperature in solution is higher than 40°-60°C. However, in parallel with this reaction, metastable hemihydrate can also precipitate being subsequently transformed into the more stable dihydrate form. When heating the dihydrate (as a solid and dry) to approximately 50°C, the chemically combined water is lost leaving the hemihydrate. 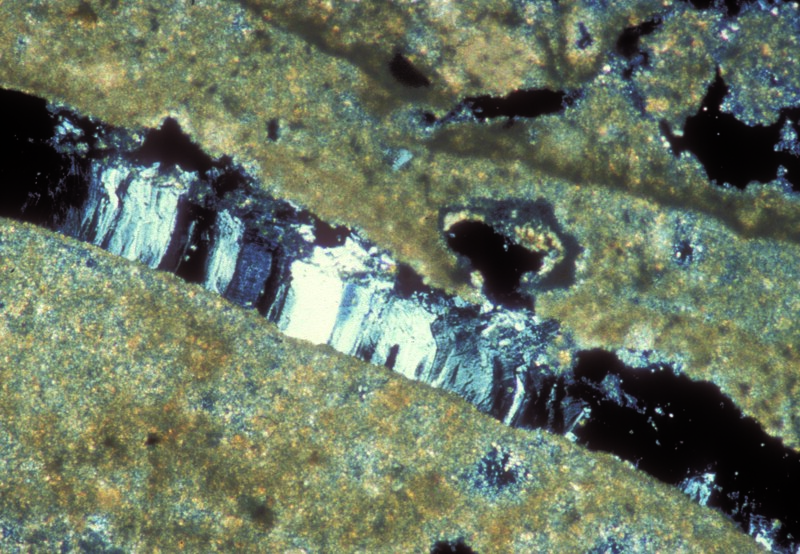 However, a complete transition to hemihydrate only takes place at temperatures of around 100°C. If the dihydrate is heated to 500-600°C, the anhydrous calcium sulfate is formed. At temperatures above 1000°C the thermal decomposition into calcium oxide and SO3 is effected.
. The pure gypsum salt has no defined deliquescence point. If, in the presence of halite, the relative humidity levels exceed 90% RH, gypsum crystals may dissolve, due to the deliqusecent behavior of halite. 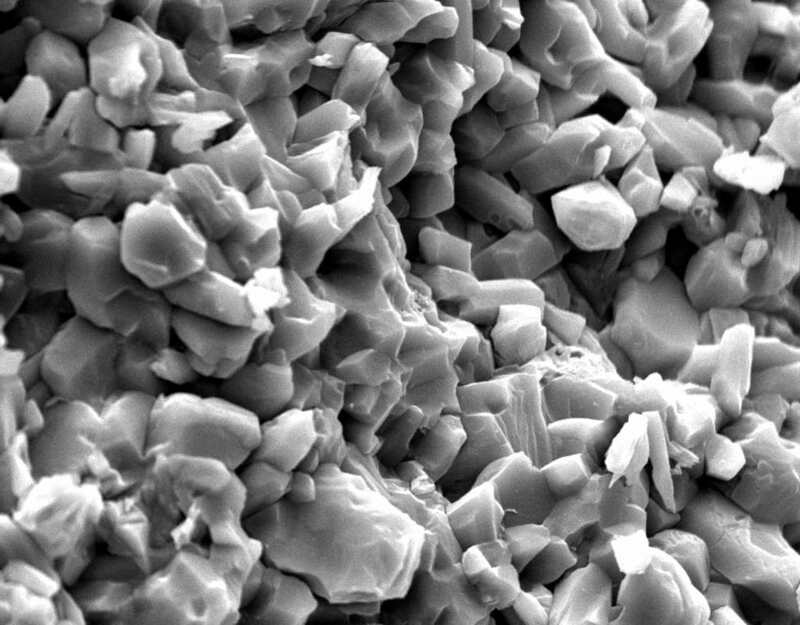 A decrease of humidity levels to approximately 75% RH will result in the recrystallization of gypsum. Author: Sperling, C.H.B.and Cooke, R.U. 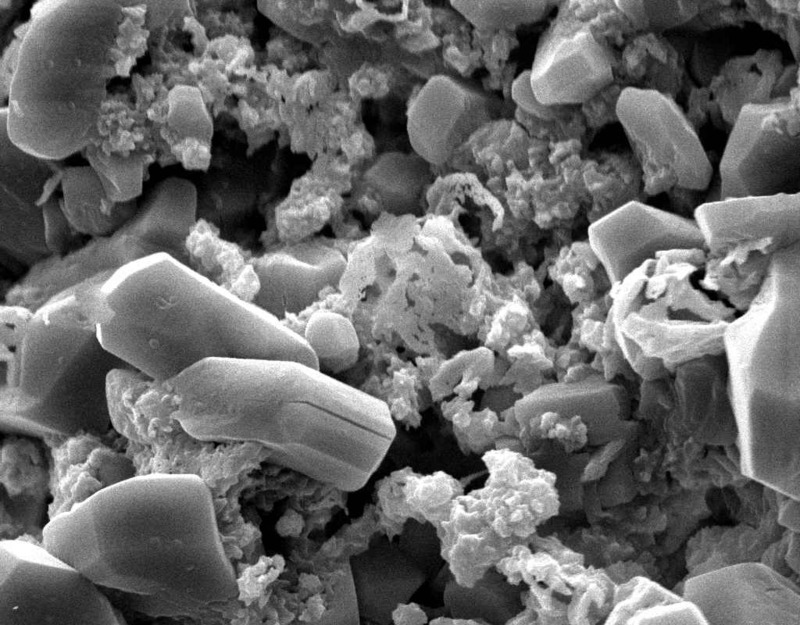 analyses the influence of gypsum on the linear hygroscopic expansion of certain sandstone materials. The damages and the change in swelling behavior of the material was explained through the influence of gypsum. Laboratory examination: Gypsum is slightly water soluble, therefore gypsum-containing sample material only dissolves slightly, when mixed with distilled Water. 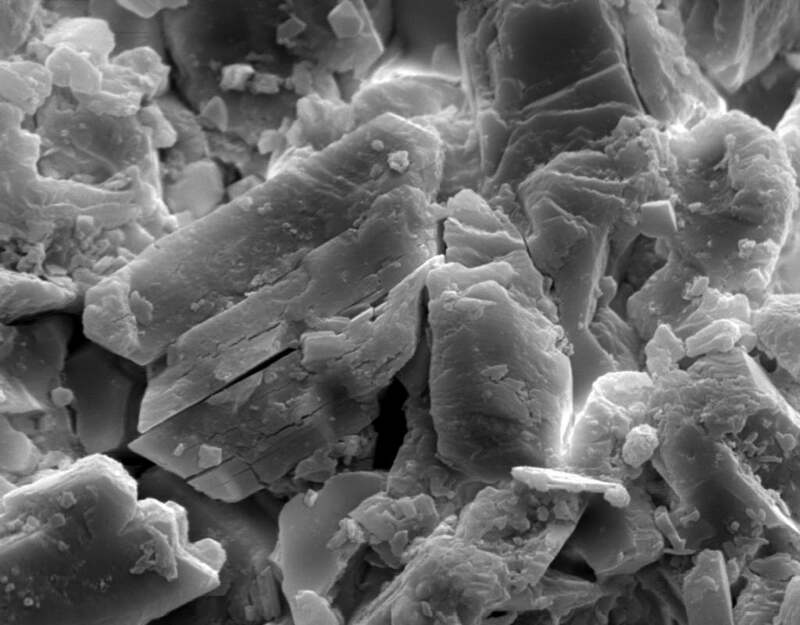 In solution, gypsum- containing sample material recrystallizes by carefully concentrating the solvent. At first, single needles form, then increasingly needle- like gypsum aggregate in proximity of the seam of the solvent emerges. Alternatively, sample material can be dissolved in hydrochloric acid, which also leads to the formation of crystal needles. 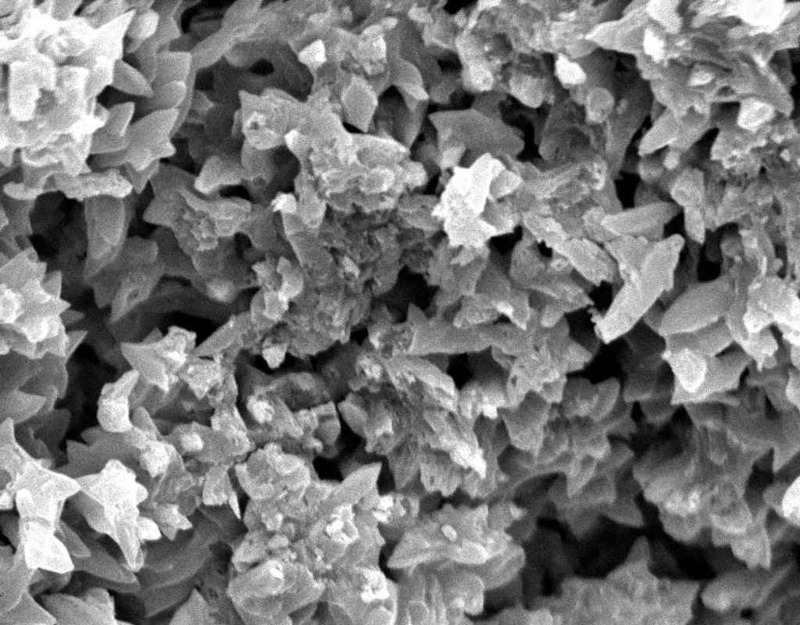 Compared to other salts that can recrystallize in needle-like shapes, e.g. sodium carbonate, gypsum needles are clearly shorter. Apart from the typical acicular habit of gypsum crystals, (especially in recrystallized material) different morphological characteristics appear. These can be useful for identifying gypsum. 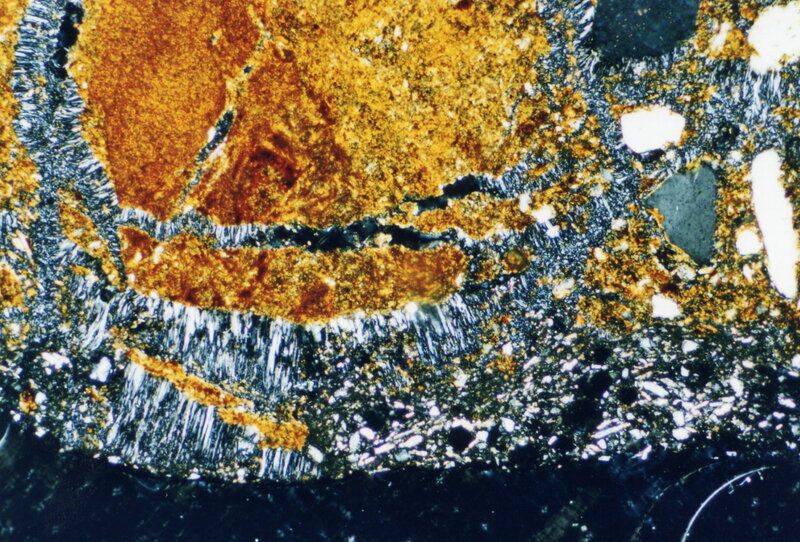 Gypsum particles (in raw material samples) display shapes of rounded fragments and plate- like rhombohedra, clearly showing the inner cleavage planes. Furthermore, the occurrence of twinning shapes is typical for gypsum crystals, whether they are lath- shaped, tabular or lamellar. The assignment of refractive indices is carried out in accordance with the immersion method using media with indices nD=1,518 und nD=1,53. Due to the often small- scale particles the examination using the Schoeder van der Kolk method is more significant and reliable than the Becke- Line test. 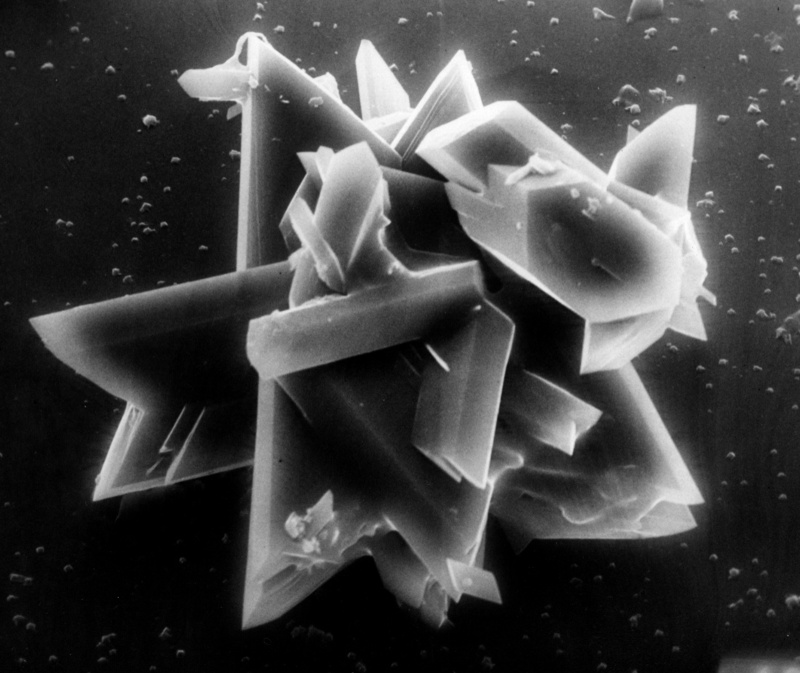 Gypsum crystals belong to the class of monoclinic crystals. 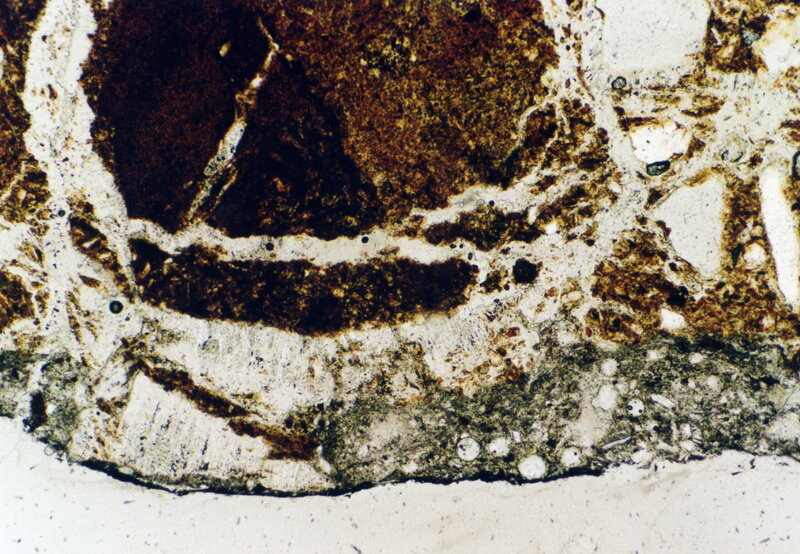 Thus, they show, depending on the orientation of the single particle under the microscope, a parallel or respectively a symmetrical extinction, but mainly exhibit a characteristicly oblique axis position in the extinction position. 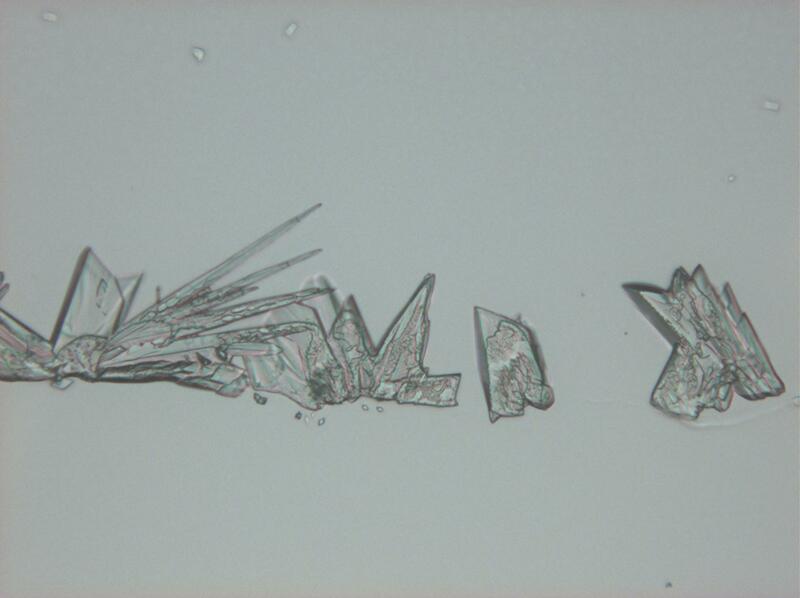 On well developed crystal rhombi the oblique extinction can clearly be measured. 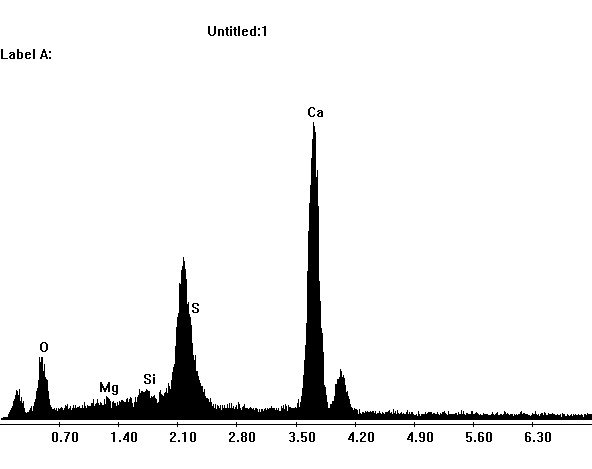 Of all calcium sulfate crystals, gypsum has the lowest birefringence. Under crossed polarizers, gypsum has very low interference colors, lying within the gray to yellowish white range of the first order, (of course depending on the thickness of the particles). The Analysis methods mentioned above clearly identify gypsum, provided the following evaluation criteria are explicitly clarified. 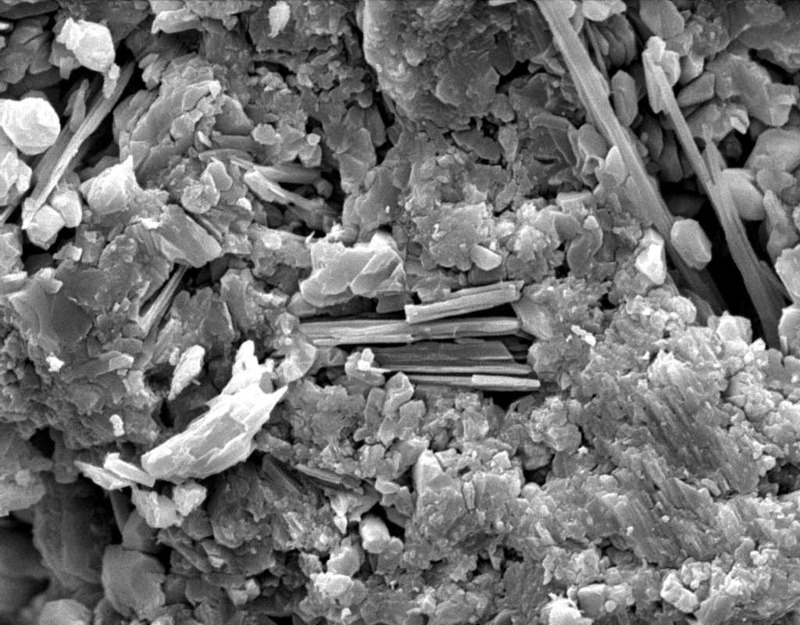 SEM micrograph of gypsum crystals. 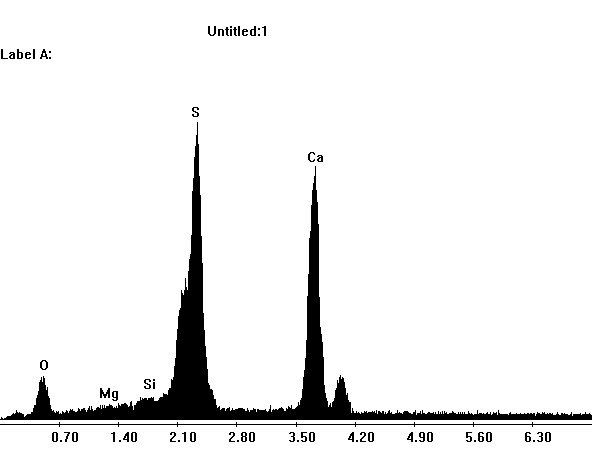 EDX spectra of gypsum crystals. 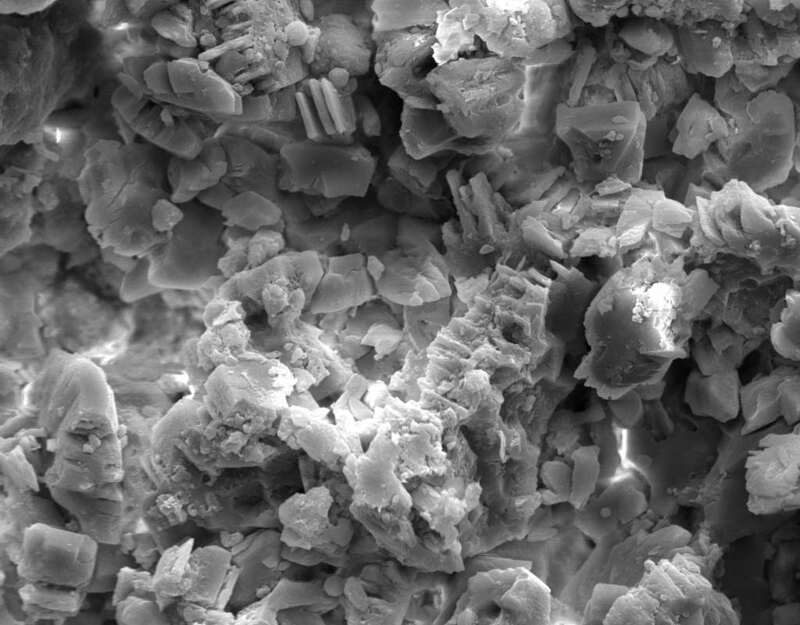 SEM of gypsum crystals grown from the hemihydrate.